The Centre for the Study of Conflict is a research centre based in the University of Ulster. Its main work is the promotion and encouragement of research on the community conflict and to this end it concentrates on practical issues to do with institutional and community structures and change. It publishes papers and books arising out of this work including: a series of research papers particularly designed to make available research data and reports; a series of Majority-Minority reports; and a series of occasional papers by distinguished academics in the field of conflict. This paper is a new publication by Keith Kyle, wherein he makes a close and original analysis of the 'Frameworks for the Future' documents on Northern Ireland, published on 22nd February 1995. This makes an important contribution to the analysis and debate and the Centre is pleased to be able to publish it. The Centre will produce, over the next few months, a set of new publications on topics such as Sport and Community Relations, Peer Mediation in Primary Schools. Parades. Education in a Divided Society and Policing a Divided Society. It becomes of the first importance, in any situation as complex as that of Northern Ireland, to be able to separate the signal from the static. This is particularly true of the blue-and-buff coloured document called Frameworks for the Future. It is my contention that it is an essentially pro-partitionist document heavily disguised in language that falls more easily to the lips of Republicans. In both respects it closely resembles the Sunningdale Agreement reached in those distant days of Edward Heath's Premiership in December 1973. In reaching these conclusions I find myself in closest agreement with two dissenting voices on the Republican side, those of Ruairí Ó Brádaigh, who was President of Sinn Féin before Gerry Adams, and of Anthony Mclntyre, a former prisoner, speaking at the What Next? conference on 3 March 1995. Ó Brádaigh, who of course dislikes the direction in which Adams has steered Sinn Féin since he took over, described the Joint Framework Document as 'a sophisticated version of the Sunningdale Agreement of 1973 with the significant difference that the Provisionals are now on board the process. As John Bruton made abundantly clear, it is a programme designed to make the Six-County statelet work better and is therefore an agenda to prolong English rule in Ireland.' According to Mclntyre, 'Nationalists, particularly those who are republican, are the big losers in all of this. The Unionists have been undermined psychologically but not the union. '1 To this all that need be added is that what Republicans stand to lose is their impossibilist demands. To deal first with questions of complexity, tortuous and ambiguity, it is a fact that these ideas must appear cumbersome for government of so small a political entity as Northern Ireland. But experience of other such situations of conflicting ethnicity, such as Cyprus,2 shows that this is inevitable once one is driven away from the straight concept of majority rule. When I first reported from Northern Ireland in 1959 and 1960 and when I first came back as a television journalist in 1969 there was a considerable reluctance to concede that the Province came under the same category of problem. Democracy decreed, one was told by the Unionist side, that straight majority rule must prevail in the Province as elsewhere in the United Kingdom. On the other hand, great efforts were made to represent the civil rights movement as being non-sectarian, and the activities in the earlier period of the Northern Ireland Labour Party and in the later one of the Alliance Party would in some quarters be advanced in support of the idea that the Province was moving swiftly away from anything that needed institutionalising on an ethnic basis. If Northern Ireland is to be treated as a pluralist society, democracy by simple-majority rule will not work; this was being demonstrated by the civil rights movement before the conflict with the IRA began. In many instances of plural societies (like Cyprus, Sri Lanka, or Rwanda) the difference in size of the two communities is sufficiently great that any treatment of them as equals runs the danger of appearing artificial and undemocratic. If the territory is itself a sovereign entity, any breakdown in an imaginative experiment in constitution-making can be catastrophic. In Northern Ireland, on the other hand, the minority community (if defined by religion) is believed to be 40-42% of the whole, while the mere fact that the territory is not sovereign means that a breakdown of the constitution, though very worrying, need not mean complete disaster. Scholars have written about achieving democracy in plural societies since the last days of the Habsburg Monarchy, when Karl Renner (later President of the Austrian Republic) and his friends developed ideas which came to be classified as consociational. More recently they have been set out by Arend Lijphart.5 Belgium and Switzerland would be contemporary European examples. Here it is sufficient to make two generalisations about such systems. The first is that, being obliged to incorporate such devices as special majorities and off-setting vetoes, they are inevitably fiendishly complicated to outline. The second is that the only way to make them function in practice is for effective working relationships to grow up between leaders who enjoy the trust of their own communities, so that informal deals between them become routinely possible. If this type of constitution is tested to death by unlimited adversary politics, it will surely die, as did the Constitution of Cyprus after three and a half years. The Framework Document may be tortuous and complex in detail. But the one feature that is absolutely clear is the affirmation by both Governments over and over again that British sovereignty is to remain in the North so long as a majority of the people of the North so favour it. There is no way that Unionists can be delivered unwillingly into a United Ireland if they remain in a majority and vote in a referendum as a block. The legitimacy of that situation will be underlined as it has never been before if the people of the Republic vote for the change in their Constitution that the Irish Government is committed to support. Since the early Seventies when the security forces first assessed that military measures were insufficient without a political solution, the task was how to separate direct action Republicans (and a community that was broadly sympathetic) from their impossibilist demands. Then and only then would negotiation become possible. The main impossibilist demand was that a referendum on Irish unity be held within the thirty-two counties taken as a whole. So long as this requirement was a sine qua non of peace, the conflict would have to continue even though no end was in sight. Being in the early Seventies for a while privy to some of the informal contacts that were even then in existence, through such channels as General Sir John Hackett, a retired Nato commander with a home in County Donegal, I can say that at least three of the ideas that feature in the Framework Document were in circulation nearly a quarter of a century ago. These were that there should be a power-sharing executive for the Province; that Britain should declare that she had no economic or strategic interest of her own in retaining sovereignty in Northern Ireland; and that the terms of a settlement should be put to a referendum held throughout Ireland on the same day but requiring a separate majority in each jurisdiction. The ideas were not turned down out of hand by the Provisionals, but the contacts were overtaken by other events, especially Whitelaw's direct negotiation with the Provos. The timing was perhaps not right. But the essence of the bargain now on offer - Republicans to abandon impossibilist demands in return for lavish recognition of the legitimacy of aspirations not so long ago treated as amounting to treason - was already being spoken about then and, in the case of the power-sharing executive, formed the central feature of the Sunningdale plan. If the local parties would not come to terms with each other the sovereign governments would show that they could. The characteristic stance of Ulster Unionists was one of immobilism. It was this which led to what they regard as a great disaster: the Anglo-lrish Agreement of 1985, another Conservative 'betrayal.' Following the Ulster Workers' political strike, there might have been a chance, if the Unionists had been open to it, of another attempt at internal power-sharing but dropping the Council of Ireland. That was always the best deal available to the majority community. But the opportunity was missed; the SDLP, and particularly its leader John Hume, became more addicted to solutions involving Dublin; and, getting weary of perpetual vetoes, the British Government reached the conclusion that, if it wanted to shift the political context in the North, it would find it easier to manage this via the Republic than with the local parties. Ultimately, in February 1994, more than eight years after the Anglo-Irish Agreement, the Ulster Unionist Party produced A Blue Print for Stability,10 which has obviously inspired some of the main aspects of A Framework for Accountable Government in Northern Ireland. The central features both of Blue Print and of Framework are an Assembly of 85 or 90 members, elected by proportional representation, hovered over by a Panel of Three, also probably elected, as in elections for the European Parliament, by a single Northern Ireland constituency, whose duties are not very clearly expressed in either document. They will not be the executive but they will have, Blueprint says, 'significant consultative, monitoring, referral and representational functions.' Under neither model would there be a Northern Ireland Prime Minister and Cabinet as there were under Stormont. The Assembly would operate in local government mode, bearing in mind no doubt that if the Macrory Report is brought fully into effect the Assembly itself would indeed be the upper tier of local government. As Unionists have been proposing ever since it was clear that there would never be a straight reversion to the old Stormont, the Assembly would work through a strong committee system, with the committee chairmen actually heading the executive departments. Blueprint says that 'the chairmanship, deputy chairmanship and membership [of these committees] would be broadly in proportion to Party strengths.' Framework says, more elaborately, that they will be 'allocated from among the members of the Assembly by the Assembly, acting by weighted majority, on the nomination of the Panel, acting by consensus,' and goes into some fine detail in suggesting a five-point plan by which this might be done. The intention is to ensure that Protestants and Catholics are appropriately empowered but, for obvious reasons, they cannot be described as such in the manner of the Greeks and Turks of Cyprus both in the Independence Constitution of 1960 and in the UN's 'Set of Ideas' for a new one. So as not to be too rigid, the system has to be designed to accommodate any normal ebbs and flows of political life there might be as well as the existence of non-sectarian elements such as the Alliance Party. This makes for more complexity and less neatness and much resort to subordinate clauses. Assuming that the system will have achieved a respectable quota of Catholic Department Heads, the Framework (but not the Blueprint) provides that a category of legislation to be labelled 'contentious' will require a weighted majority to pass. It will be weighted, says the Framework, 'at a level to be determined' - which level would be all important since it would decide whether such a measure needed more than Unionist support. The document suggests tentatively that it 'could be in the order of 65-75 %. 'The decision which legislation should be labelled contentious' would be made by a Business Committee (membership unspecified) or by petition of above a minimum (as yet uncertain) of members of the Assembly. Since the Panel of Three, which looks like an attempt to institutionalise the role of deal-making leaders in the consociational model, has to reach its decisions by consensus, one cannot help speculating what the chances are of this coming about on a routine basis. If the members are elected on the same basis as the MEPs would the vote produce a similar result? Would lan Paisley come out ahead of the pack, would John Hume get the second seat and what Unionist would get the third? Or would the more normal order of Unionist parties prevail in a domestic setting? Perhaps the prospects of such a system getting off the ground looked a trifle more plausible after seeing on television the three present MEPs sitting together in Strasbourg on 5 April 1995 purring with pleasure and mutual regard after they had pulled off a good economic deal for Northern Ireland with the EU. The problem with the projected Northern institutions will be to co-ordinate them effectively, thus perhaps providing the opportunity for, say, an SDLP-led department to go further in co-operation with the matching Southern department than Unionists might wish. Again, as with most things about these arrangements. it greatly depends how effectively the Panel of Three is to operate. One item that is mentioned as a top candidate for designation from the outset for executive handling by the all-Ireland body is European policy, particularly in respect of EU-funded programmes and initiatives. It should be an interesting variation of European regional policy to find a body representing one whole member state and a piece of another dealing with Brussels. One cannot but consider ironic the zeal with which John Major's Government has called in aid European institutions and Community habits of thought to the solution of the Irish problem. When on her only land frontier, Britain is required to think European she does so, even under a Tory Government beset with difficulties over European issues. While Unionists have some cause for dismay at the rigorously neutral attitudes and unsentimental formulations adopted by the British Government, it must be hoped that they will now engage seriously with the framework documents. How these would work out for them depends on how they assess the morale of their own community. Some of the statements made since the publication of the documents leave an impression of pessimism about their nerve and stamina, if placed in the context which the frameworks suggest. There are passages in the March issue of The Burning Bush which make one feel that sections of the Democratic Unionist Party are of that frame of mind. That is surely to underrate the spirit and the staying power of the Unionist population. Their constitutional position will only be undermined by the institutions suggested by these discussion documents if they would have it so. Click on the icon to return to the text reference. 1 For the Ó Brádaigh and McIntyre material and for some subsequent quotations I am indebted to the Northern Ireland Political Collection at the Linen Hall Library, Belfast. 2 Keith Kyle, Cyprus. A Minority Rights Group Report (MRG, 1984). 3 Seamus Dunn, 'The Conflict as a Set of Problems' in Dunn (ed.) 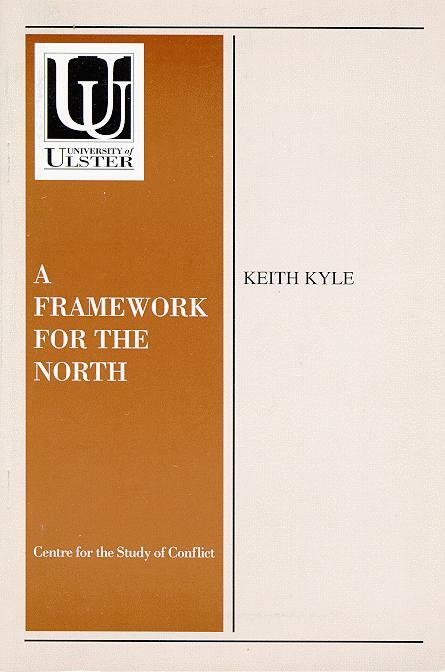 Facets of the Conflict in Northern Ireland (Macmillan, 1995). 4 A. C. Hepburn, 'Long Division and Ethnic Conflict' in Seamus Dunn (ed.) Managing Divided Cities, p. 93. 5 Arend Lijphart, Democracy in Plural Societies (Yale University Press, 1977). 6 David W. Miller, Queen's Rebels. Ulster Loyalism in Historical Perspective (Dublin: Gill and Macmillan, 1978). 7 P. Buckland (ed.) Irish Unionism, 1885-1922 (HMSO, Belfast, 1972). The incident that gave rise to the accusation of betrayal was a plan to devolve local government powers to a central Irish Council. It caused a major outcry and was never pursued. 8 Keith Kyle in David Watt (ed.) The Constitution of Northern Ireland. Problems and Prospects (Joint Studies in Public Policy 4 Heinemann 1981), p. 210. 9 Political Comment from The Burning Bush, March 1995. 11 Political Comment from the Burning Bush, March 1995, op. cit. 12 Brendan O'Leary, 'Party Support in Northern Ireland, 1969-1989' in J. McGarry and B. O'Leary, (eds.) The Future if Northern Ireland (Oxford. Clarendon Press, 1990). 13 Ulster Unionist Party, 'A Practical Approach to Problem-Solving in Northern Ireland,' 21 February 1995. 14 Rula Law, 'Wrong On Rights', Fortnight, March 1995, p. 27. 15 Robin Wilson, 'Listen To The People', Fortnight, March 1995, p. 5. Keith Kyle is Visiting Professor of History at the University of Ulster. He reported for The Economist from Northern Ireland in 1959 and for the BBC Television programmes Tonight, 24 Hours, and Newsweek between 1969 and 1980. He was for twelve years an executive member of the British-Irish Association and was a member of the Donaldson Commission which in 1984 drew up a Policy report on Northern Ireland for the SDP/ Liberal Alliance.